Chaos reigned supreme at the Karnataka Assembly as Speaker Ramesh Kumar suggested handing over the investigation of the audio tape to SIT. The BJP is opposed to the idea of SIT probing the issue as none other than CM Kumaraswamy himself will form the panel. Bengaluru: If there is one word that would sum up as to what happened in the Karnataka Assembly on Monday, it would be pandemonium and pandemonium alone! As expected, the issue of the audio tape involving former chief minister BS Yeddyurappa (BSY) and the son of a JD(S) MLA stormed the house right from the beginning. Incidentally, Speaker Ramesh Kumar offered to resign as his name too cropped in the conversation that BSY had allegedly had. But the ruling party members successfully persuaded him not to put in his papers. But the most crucial part of the entire discussion in the House on Monday was pertaining to the investigation relating to the case. 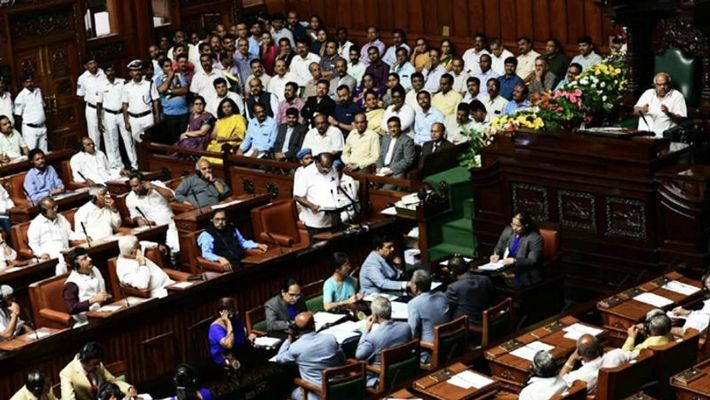 After a long and heated debate, the Speaker suggested to chief minister HD Kumaraswamy that the matter be handed over to the SIT or the Special Investigating Team. Though there were talks of the investigation being handed over to the House Committee or asking for a judicial enquiry, it didn’t fructify as it is allegedly ultra vires of out of bounds for a House Committee to investigate an issue of this magnitude. However, there are several questions that have remained unanswered. One of them is whether the SIT would file an FIR in this case? If yes, against whom would it be? Secondly, would an FIR be filed in the first case? In such a scenario, where an FIR wouldn’t be filed, the SIT would be reporting its findings to the Speaker himself. The SIT has been presently given a fortnight to submit its findings. Meanwhile, the BJP is certainly not happy with the issue being handed over to the SIT. They are still insisting that the matter be handed over to the House Committee or judicial inquiry be held. While the hullaballoo continues over the audio tape, there was much embarrassment in store for Kumaraswamy as BJP MLA MP Renukacharya presented a CD allegedly having visuals of the CM having conversations with Vijugouda Patil, purportedly seeking Rs 25 crore for an MLC seat. The war of words over the audio tape and the allegations and recriminations are far from over. When the House reconvenes on Tuesday, we can expect more and more verbal pyrotechnics.